Cook From The Hip: Bacon, Eggs and Cheese for Dinner? Sometimes the simplest foods are the best foods. This recipe is yet one more way to use that big block of Parmigiano-Reggiano. Also I get to continue my obsession with Italian food. A perfect easy Sunday dinner. Fill a pot with water and set to boil. Heat a different pot on medium high and add the oil and pancetta. Stir the pancetta so that it browns evenly. While the pancetta is browning, hopefully the water has reached a boil. Add salt and the pasta, cook according to package directions. Add the minced garlic. When the garlic softens, turn off the heat. Beat the egg with the grated Parmesan. 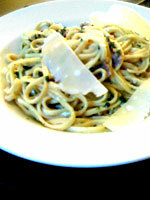 Drain the cooked pasta, reserving ½ cup of the cooking liquid and immediately add the wet pasta to the pancetta. Stir in the egg mixture, the parsley and salt and pepper. Toss till the sauce thickens. Add some of the pasta water if necessary if the egg mixture gets too thick. Serve the pasta in a bowl with the Parmigiano curls.